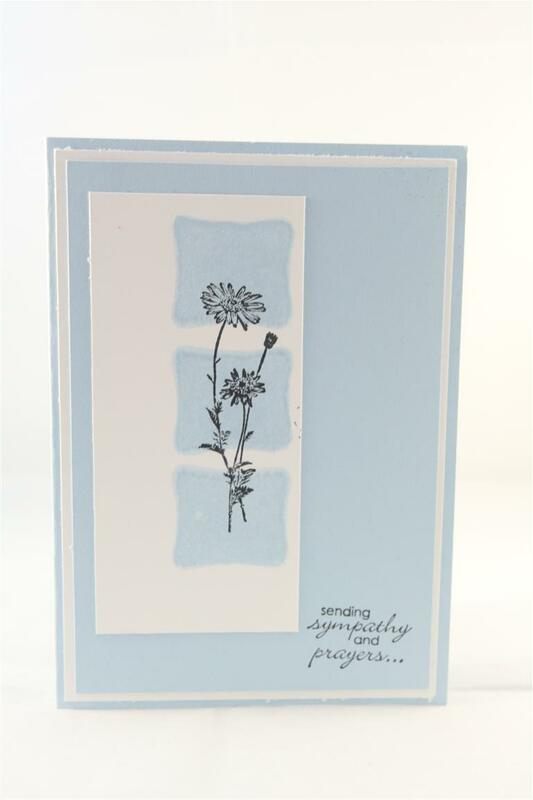 Today is a sympathy card, kept very simple,and all white ( I do love an all white card…did you guess that?) I have dry embossed a layered background with a stampin up embossing folder, Foiled a couture creations hot foil stamp with silver foil, die cut that piece with a stitched oval die, and then just added a few flowers. So many things on just now… still trying to get organised for my craft fair in a couple of weeks, and then it will be full steam ahead organising my six classes for the cruise next february. I know that seems a long time away but time continues to fly and there is a lot of preparation work for the cruise classes 2 cards each class and all die cutting and embossing have to be done beforehand to limit the amount of luggage I have to take on board. It’s all good fun! Til tomorrow…. Todays card is in a similar simple style to yesterdays card, With an embossed layer ( kaisercraft Frame embossing folder) and a fussy cut flower arrangement from a piece of Kaisercraft Golden Grove 12 x 12 sheet. The Thinking of You sentiment is from the 6″ pad of the same collection. Only a couple more card to go in this collection before we move on to something new… Today I am off to the retirement village to catch up with my ladies and show them a card or two. In the meantime I have a big pot of vegetable soup simmering on the stove for tea, and for now I will head off to the half tidy craft room to get my bag ready for this afternoon.. til tomorrow…. Todays kaisercraft Golden Grove card is a very very simple one. When i do Thinking of you or Sympathy cards i like to keep them quite clean and simple and for this one I used a kaisercraft frame embossing folder, fussy cut a flower from the specialty sheet of Golden Grove, and the sentiment was from the sticker sheet of the same range. I did ink around the edge of it with Tea Dye distress ink so that it didn’t blend right in to the background layer, and popped it on with foam pads for a bit of height. I am working tonight as I have a class to teach, so this morning I have been grocery shopping, but now I am going to conserve my energy and sit and sort my flowers into colour coded bags..bliss….Til tomorrow…..
A change of pace today with a couple of thinking of you cards made with kaisercraft ma Cherie paper collection. I fussy cut the flower sprays from a sheet of 12 x 12 paper, and the lovely embossed paper on the background id from the 6 ” pad, as is the greeting and butterfly.very similar cards – subtle differences – the background papers are two different papers, and the cardstock used are two different shades of grey. This morning I was digging through my graphic 45 paper looking for special papers to use for a village lesson,and I need a lot of the same paper as my ladies want to learn how to make a bendy card and graphic 45 is the only paper I have in large quantities – mainly because once home with it I find it very difficult to cut into – I love it that much!Going through it all Ideas were springing from everywhere – I will never have enough time to make everything I want to, but at least I have realised the time has come to use this paper!So any spare time this weekend will be spent with Graphic 45!Til tomorrow…. Todays’ card was one I taught over at the retirement village. I always keep sympathy cards simple. Stampin Up cardstock – white and bashful blue, and Stampin Up stamp set.I didn’t have a square stamp so I used a piece of foam offcut for the shape behind the flower. Quick post this morning, time for work…til tomorrow…. What a mixed bag of cards I have posted the last week or so! 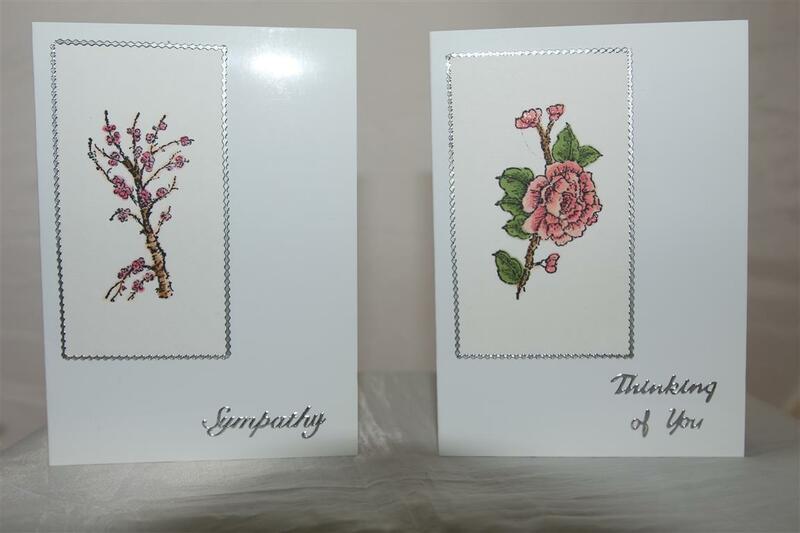 Today it’s sympathy cards.I always keep sympathy cards very simple, and these are no exception. I have used white card bases, and stamped my image on white card as well, coloured with copic markers and stuck on the card, and used border stickers around the outline.The stamp set is one I have had for a few years from Stampin Up called Eastern Influences.Today i have finally started my christmas cards, eased in slowly with some simple ones using dies,. Tomorrow Nathan and I will have a photo session and I will be able to start posting my most recent makes. til tomorrow….